China-Gel, Inc. has added to their topical pain reliever line by introducing China-Gel White, a color free version of the popular topical pain reliever. Featuring the same great herbal formula only without any dye, China-Gel White will be available in all of the current sizes. "Based on requests from medical professionals and patients who use the product, we decided to launch a color free version of the original formula," stated Justin Toups, Marketing Manager, China-Gel. "We are delighted with opportunities to provide medical professionals the products they want, so they, in turn, can provide the necessary care for their patients. The original green formula will continue to be available as well." 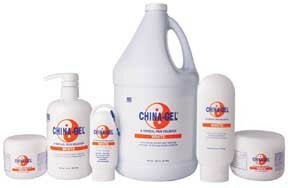 Developed by a chiropractor, China-Gel is an herbal topical pain relieving gel that incorporates modern technology with ancient pain relieving concepts of Chinese medicine. Resembling a fine hand cream, it spreads on evenly and then absorbs completely into the skin without staining clothing or needing to be wiped off because there is no greasy residue left behind. It has a pleasant and soothing lavender/menthol fragrance on application that ultimately becomes odorless as the gel is absorbed. CRYODERM Cryotherapy products provide fast acting, deep penetrating pain relieving cold therapy for muscle sprains and strains, sore stiff muscles, bursitis and tendonitis, arthritis and joint pain. The secret of this pain reliever is its deep penetrating, long lasting cold sensation and natural ingredients such as Arnica to reduce bruising and inflammation; Boswella to reduce inflammation; Eucalyptus, which is a pain reliever that is also anti-bacterial; Ilex, which releases muscle spasms and reduces inflammation; Menthol, which is anti-inflammatory and a pain reliever; MSM, which increases topical membrane penetration, is an anti-inflammatory and a local analgesic; Peppermint Oil, an anesthetic, vascular and lymphatic system stimulant, which creates a burning cold sensation aiding in eliciting the Gate Theory, and Natural Denatured Grain Alcohol: For external use only. THERMODERM HEATING products provide fast acting, deep penetrating pain relieving warmth for muscle sprains and strains, sore stiff muscles, bursitis and tendonitis, arthritis and joint pain. The secret of this pain reliever is its deep penetrating, long lasting gentle warmth, and natural ingredients such as Aloe Barbadensis, Arnica, Boswella, Green Tea Extract, Ilex, MSM, Tocopheryl Acetate, Yucca Aloifolia, and Natural Denatured Grain Alcohol: For external use only. CRYODERM and THERMODERM Gel can be used in place of massage creams and oils for myofascial release, trigger point therapy, transverse friction and deep tissue. To enhance ultrasound, treat the patient with CRYODERM or THERMODERM and then place an FDA approved ultrasound medium over the area and perform the treatment.